A disease of bones that leads to reduced bone mineral density (BMD) and increased risk of fracture. Primary type 2: senile osteoporosis occurs after age 75 and is seen in both females and males at a ratio of 2:1. 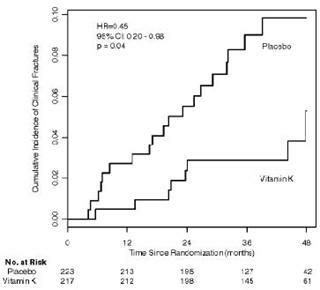 Vitamin K Supplementation in Postmenopausal Women with Osteopenia (ECKO Trial): A Randomized Controlled Trial; PLoSMed. 2008 October; 5(10): 1–12.